A urinary tract infection usually refers to a bacterial infection of any or all parts of the urinary tract, but most commonly involves the urinary bladder (bacterial cystitis). UTIs are common in dogs, especially females, but are uncommon in cats less than 10 years of age. However, cats older than 10 years of age have a higher risk for a UTI, which is often associated with other diseases (especially chronic kidney disease). 1. There must be a break, either temporary or permanent, in the animal’s defenses. 2. Bacteria must migrate into the urinary tract, catch hold and multiply. There may or may not be symptoms associated with a bacterial UTI. Symptoms are often dependent on which part or parts of the urinary system are infected. The urinary bladder is most often infected, in which case one often observes signs of urgency and frequent urination (pollakiuria). Other symptoms may include blood in urine (hematuria), straining to urinate (stranguria), foul-smelling urine, urination in inappropriate places, inability to hold urine, and urinating small volumes or not passing any urine while posturing to urinate. Less commonly, a bacterial UTI may involve one or both kidneys. Obvious symptoms may not be present but may include fever, abdominal pain, inappetence, lethargy, blood in urine or vomiting. In reproductively intact dogs and cats, the infection may also involve parts of the genital system (uterus in females or prostate in males), and clinical signs may relate to the infection in these locations. These described symptoms do not always mean that a UTI is present. All of these problems may occur because of diseases other than a UTI. For example, many cats less than 10 years of age do not have a UTI but instead have sterile inflammation of the bladder (sterile cystitis) or urinary stones. The symptoms observed are the same as those seen with a UTI. To diagnose a UTI, your veterinarian should collect a sterile urine sample from your pet. The best method to collect urine is by a technique called cystocentesis, during which a needle is inserted through the body wall into the bladder and urine is removed by a syringe. This technique is very safe and painless to your pet. Free catch urine samples or samples obtained from the floor or office examination table are invariably contaminated samples and not suitable for evaluation to determine infection. Your veterinarian will analyze this urine sample (urinalysis) and examine a small amount under a microscope. If either, or both, bacteria or increased numbers of white blood cells are present, your veterinarian will suggest performing a urine culture. The presence of white blood cells means that inflammation is present but does not necessarily mean there is a UTI. Likewise, in an animal whose immune system is compromised or who has highly diluted urine, a UTI may be present, but the urinalysis may not reveal white blood cells or bacteria. A urine culture is the best method for confirming the presence of a UTI. A urine culture involves sending a small part of the collected urine to a laboratory that will try to grow the bacteria. If no bacteria grow, then a UTI is unlikely to be present. If bacteria grow, then the organism will be identified and antimicrobial susceptibility will be performed by the laboratory. Antimicrobial susceptibility testing usually takes two to five days for completion. 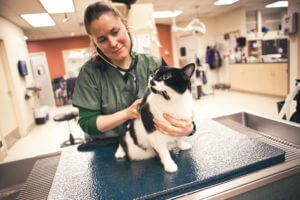 In some animals, additional testing may be required, such as blood work or imaging studies (radiographs or ultrasound) because a bacterial UTI may occur as a result of or in combination with other diseases (e.g., bladder stones, chronic kidney disease, feline leukemia virus). Antibiotics are prescribed to treat bacterial UTIs. The duration of treatment depends on many factors: pet species (dog or cat), the animal’s age, whether this is a first time UTI or a recurrence, the bacterial organism, what antibiotics the bacteria are sensitive to, and if there are complicating factors. A simple (or uncomplicated UTI) occurs primarily in spayed female dogs and is not associated with systemic illness or complicating diseases. In this case, antibiotics are typically given for 7 to 14 days. A complicated UTI occurs when there are one or more complicating diseases or if the UTI is recurrent. Remember that young cats rarely have a UTI, and in older cats a UTI is usually complicated by chronic kidney disease. Another example of a complicating disease is diabetes mellitus, or hyperadrenocorticism (Cushing’s disease). In animals with a complicated UTI, antibiotics may be recommended for three to six weeks. A urine culture will likely be recommended at some point during the treatment to ensure the UTI is under control and then again after the antibiotic treatment is finished to ensure the UTI is cleared. Although other treatments are sometimes recommended (i.e., cranberry juice), no conclusive evidence proves they are of benefit to dogs and cats. Prompt and appropriate antibiotic treatment based on urine culture and sensitivity is the best way to eradicate a bacterial UTI. In most instances nothing specific can be done to prevent a UTI. Your dog or cat should be re-evaluated if clinical signs recur. With complicated UTIs, your veterinarian should periodically evaluate your pet to make sure that the UTI has not recurred or is under control. In some animals with complicating factors, a urinary antiseptic or an antibiotic must be given long term to prevent recurrence of a UTI.